(0 Customer Reviews) | Write Review 6 issues per year HMO Magazine app is the UK’s number one source and the only magazine that focuses directly on the HMO Property market. The magazine provides practical information and news related articles, and advice on all aspects of HMO management, investing, selling, furnishing, accounting, tax strategy’s, utilities, insurances, legal requirements, mortgages, buying and selling tips and very much more. Giving you that competitive edge with your property investment by providing relevant news coverage and in-depth analysis reports, by the leading HMO landlords, investors and developers in the UK. Subscribe now to benefit from cost savings and enjoy having this unique resource for this unique market. HMO Magazine puts the strategies of Successful HMO Landlords, investors & developers at your fingertips. Giving you insight into HOW the UK's Most successful HMO investors achieved their success so you can model with actionable advice. So download this magazine for FREE now and start growing your business as a HMO Landlord or investor today! MARKETING AND DEAL SOURCING: Rick Gannon explains how to target and build successful campaigns that keep those leads coming in. GETTING MONEY OUT OF YOUR HMO: Wendy Whittaker reveals the steps you need to take to add value to your investment and recycle that cash over again. COULD YOUR TENANT BE ON THEIR WAY OUT? : Ashley Royer reveals the signs that indicate a tenancy may be coming to an end before it happens. Plus much more from your go-to magazine for HMO landlords, investors and developers. 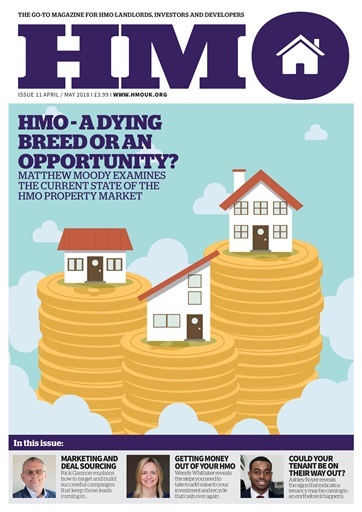 HMO Magazine app is the UK’s number one source and the only magazine that focuses directly on the HMO Property market. Whether you are a seasoned investor or just starting out, let the information provided be the inspiration you need to take the next step to growing your portfolio as an investor. You'll receive 6 issues during a 1 year HMO magazine subscription. You'll receive 6 issues during a 1 year HMO magazine print subscription.